Great prices on quality Horse Galloping Boots, horse supplies and many great equine products at Horse Tack Now. 100% satisfaction guaranteed. This beautiful galloping boot is designed to protect the lower part of the leg with a hard outer shell and two hook and loop closures. 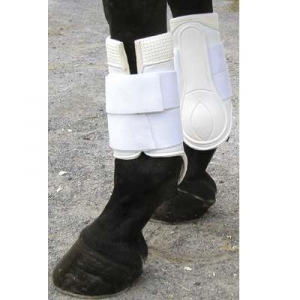 This product comes in a nice white color and will provide excellent comfort for your horse. These are top of the line Horse Galloping Boots sold at discount pricing.